Gold’s Gym Fitness Institute members and New York City–based personal trainers, Sue Fleming and Nikki Kimbrough, are pros at making exercise plans for busy clientele. They designed a 10-step sweat-free workout that fits into any schedule and burns up to 350 calories, i.e. one serving of macaroni and cheese. And they explain how to increase that number to 500 calories when you do make it to your local Gold’s Gym. That extra effort could help you lose up to one pound per week according to the National Institute of Health. So stop making excuses and use that office downtime to up your fitness level. All you need is a resistance band and a few extra minutes throughout the day. Anywhere: Stand facing a desk or counter an arm’s length away. Rest your hands on the edge, palms down, and fingers forward and slightly wider than shoulder width apart. Lean in, then walk your feet out in back. Lower your hips slightly so that your body forms a diagonal line. Balancing on your toes, bring your right knee toward your chest. Alternate legs continuously. At the gym: Start in a plank position, with hands just wider than shoulder width apart, body straight out, core tight. While balancing on toes, bring your right knee toward your chest, then alternate legs as if you were running continuously. “Really focus on keeping your core tight,” Kimbrough says. “When you lift your leg, focus on the lower abdominal region and use those muscles to bring that knee up.” The more you use your abdominals, the less strain you feel in your back. Anywhere: Stand with feet hip width apart. Place a resistance band under your feet while gripping one end in each hand. Lower your hips to a squat position and slowly stand up. Next, curl your hands up to your shoulders like you’re doing a bicep curl, then raise your hands above your head. Lower your arms. Repeat. At the gym: Replace the resistance band with barbells or a weighted fitness bar. Make sure to keep your elbows close to your sides as you curl your arms to your shoulders. Keep your back straight and your core tight when you raise your hands above your head. “This is great for a midday energy burst because you are working more than three muscle groups with one exercise,” Fleming says. 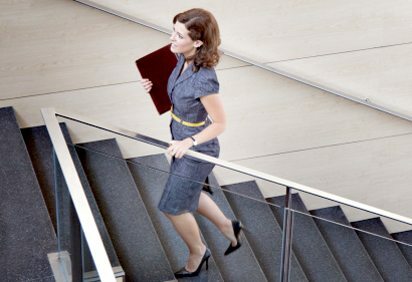 Anywhere: Almost every office building has a set of stairs, take them instead of the elevator to a meeting or take an afternoon break and do a full 10 minutes. Take two steps at once if you’re feeling extra energetic. At the Gym: Use the stair climber and increase resistance when you can. Add back leg kicks and side steps for an even better leg workout. It’s a well-known, but highly effective fitness step: Take the stairs whenever you can. Anywhere: Sitting in a chair, lift your arms above your head. Lean over and curl your back over your knees until your fingers almost touch the ground. Pause. Raise your arms again above your head. Repeat. At the gym: Grab a stability ball and balance on it with your stomach on top and your toes on the ground. Let your torso fall over the ball, and relax your arms by your sides. Starting with the head and upper back, slowly lift your spine until it’s straight. Anywhere: Sit on the front edge of a chair (without wheels). Place your hands along the sides of your body, holding the sides of the chair. Kick your legs straight out in front of you, toes flexed, and lean back in the chair as far as you can while keeping your back straight. Then simultaneously bring your knees and chest toward each other as close as you can. Return to starting point, and repeat. At the gym: Sitting on a bench, repeat exercise above. Stabilize your body by holding the sides of the bench. For an even better burn, remove your hands from the bench and cross your arms over your chest. This move may seem tough at first, so Kimbrough advises beginners to start by keeping one leg on the floor and lifting the other knee up, then alternating. And last but not least, take your time when you do these. “Too many people try to rush it,” she says. Anywhere: Tie a resistance band around a doorknob and close the door. Stand with your feet shoulder width apart and your body at a 90-degree angle from the door (start on your right or left side). Grab the band with both hands and hold it at shoulder height. Pivot on your feet to turn your body away from the door while pulling the band across your body. Switch sides. At the gym: Repeat the exercise while holding dumbbells. “This works your obliques (the muscles on the side of your stomach) and shoulders, which are often overlooked,” Fleming says. You can increase the intensity of the move by walking farther from the door to pull the resistance band tighter. Anywhere: Lie on the ground with the resistance band behind your back. With elbows straight out from the shoulders, lift your hands straight into the air, then bring them together above your chest. Pause. Then lower hands back down. At the gym: Replace resistance band with dumbbells or a barbell and lie down on your back on a bench. “If you want to increase the difficulty, just loop the band around your hand a few times to shorten it,” Fleming explains. A daily dose of this exercise will help you perform better pushups or, for the yoga devotee, chaturanga dandasana. Anywhere: Take a lunch stroll and a brisk evening walk to get an easy dose of burned calories. At the gym: Add a boost by walking on an inclined treadmill or walking with ankle weights. Anywhere: Stand in front of a step or chair. Put your left leg on the step in a bent position at all times. (Do not straighten leg.) Keep your right leg on the floor. While your left leg is still and bent, quickly raise your right leg and tap the ball of your foot on the step, then lower your foot to the floor. Switch legs and repeat. At the gym: Hold a dumbbell in each hand and repeat the exercise above. “This move might seem familiar to people who use the stair machine, but the difference here is you have to keep the nonmoving leg at a bent position, and that really gets your quads working,” Kimbrough explains. The burn in your quads will get your heart rate up and can push you through a late-afternoon energy slump. Anywhere: Place your back against the wall with your feet hip width apart. Slide down until your legs form a 90-degree angle. Make sure your knees are directly above your ankles and the back of your head is against the wall. Begin holding for 10 seconds, then increase your hold time when you can. At the gym: Place a stability ball between your back and the wall and repeat the exercise above. For an even better burn, add 10 dumbbell curls per wall sit. “The great thing about this move is that all you need is a wall and a little time,” Fleming says. “Do it while you wait for an appointment, or for the commuter train to pull in.” People might look at you funny, but you will look better in the end.